My biggest giveaway yet! | Fleur d'Elise: My biggest giveaway yet! Ready for it? 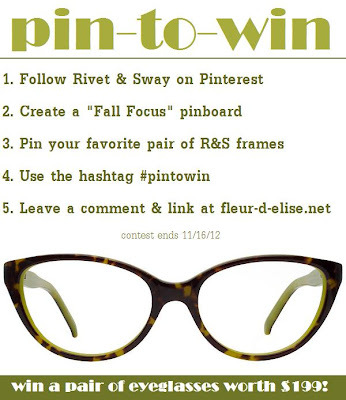 Rivet & Sway is giving away a set of frames worth $199! This time, there won't be any boring Rafflecopters involved. Instead, it's going to be a Pin-to-Win and the reader with the most creative and detailed board will win her choice of stylish glasses, complete with prescription lenses! If you don't have a Rx, that's OK, too. Rivet & Sway glasses can also be made with high-quality, non-prescription lenses, and include a 100% UV filter coating. Here are some images of their gorgeous frames if, for some reason, you need more reasons to enter. OK, are you ready to enter? 2. Create a pinboard called "Fall Focus". Be creative! If you need some ideas for your board, Both Rivet & Sway and I have created a Fall Focus pinboard. Here's mine and here's the one created by Rivet & Sway. The winner will be chosen by me and Rivet & Sway! I'd love some fashionable new nerd goggles! This was a fun contest! OOOH love all the frames! How does anyone pick a favorite? Loving this contest. Thanks for introducing me to Rivet & Sway! Here's my fall focus board.